Do you remember in March I let the garlic in my kitchen sprout? Yes, it’s been almost three months and no news about the shoots. I am guilty of being neglectful with you, my readers. The fact is I’ve harvested the garlic shoots (蒜苗) twice but I was not motivated enough to record the events. This weekend however I collected another batch of these flavorful young shoots and made the classic Twice Cooked Pork (回鍋肉). This time I am determined to share the marvelous herb and dish with you. Garlic shoots are the very tender young greens sprouting out from common garlic. They have the same distinct pungent garlic taste but are sweeter and not as strong as the bulbs. They are used throughout China in many different types of dishes. But somehow Sichuanese have a special fondness for them. Many traditional Sichuan dishes incorporate garlic shoots as a flavoring agent. Dishes such as Stir-fried Dried Tofu with Garlic Shoots (豆干炒蒜苗), Stir-fried Cured Pork with Garlic Shoots (蒜苗臘肉), and dare I say, Stir-fried Dog Meat with Garlic Shoots (蒜苗燒狗肉). 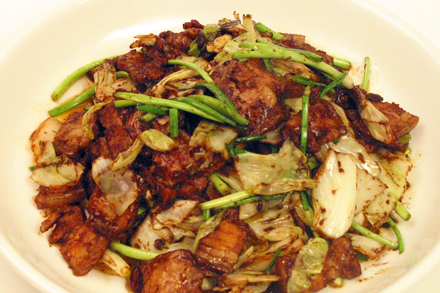 But the best-known classic dish that relies on garlic shoots is non other than Twice Cooked Pork. This dish relies on Sichuan hot bean paste and sweet wheaten paste for the sauce, and garlic shoots to round out the spicy pungent taste. Twice Cooked Pork was introduced to America during the 1970’s when Sichuan and Hunan dishes were first made available. Then as now, most restaurants use hoisin sauce instead of Sichuan hot bean paste and sweet wheaten paste. Hoisin sauce was readily available then but not the others. The use of hoisin sauce in this classic dish is the origin of many of the brown sauce dishes we now find in so many takeout Chinese restaurants. Twice cooking is a generic term for a cooking technique. The name “twice cooked” refers to the fact that meat is precooked before being stir-fried. This technique is excellent for making use of tough meat in a stir-fry dish. For best results it is common to use cuts of meat with high fat. The most often used meats are pork belly, beef shin, and lamb leg meat. The meat is precooked by boiling in water until tender, cooled, cut into very think slices and then used in the final stir-fry. 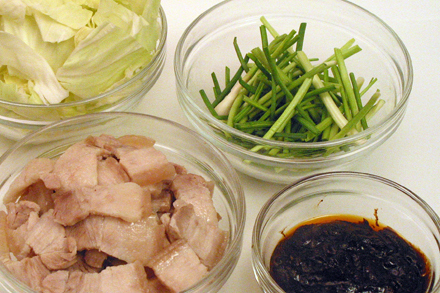 The recipe that follows is the traditional method for making twice cooked pork. Regular cabbage and garlic shoots are two main ingredients. Although I’m sure you will have no trouble finding cabbage from your local markets, I doubt you will be able to obtain garlic shoots readily. They are not even available in New York’s Chinatown. That is why I often plant them so I can enjoy this classic dish in its most authentic form. But if growing garlic and waiting for three weeks to harvest the shoots is not your cup of tea, I encourage you to substitute scallion for garlic shoots. There will be a slight difference in the taste but the result will still be delicious. 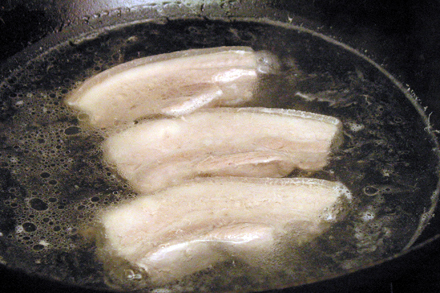 Put the strips of pork belly in a wok or a pot and completely cover the meat with water. Bring the water to a boil and immediately turn the heat down to a simmer. Cook the meat for about 45 minutes. Skim the scum that forms on the top regularly as the meat is being cooked. Drain the pork and let cool. Cut the pork into very think slices of about 1/8 inch thick and set aside. When you’re ready to stir-fry, heat the vegetable oil in a wok until just beginning to smoke. Add the cabbage and stir-fry for about 4 minutes. Be sure to keep stirring so as not to burn the cabbage. Remove the cabbage from the wok and set aside in a bowl. Put the sauce mixture into the wok and stir-fry for about 30 second or until fragrant. Add both the pork and cabbage into the sauce and continue to stir-fry for another 2 minutes or so. Then add the garlic shoots and stir-fry for additional 30 seconds. Turn the heat off and add the red chili if using. Plate and serve immediately. I think my coop (here in New England) sells garlic shoots. I remember buying them last year and making up a recipe to use them. I’ll have to check to see if they have them again this spring! — At the Greenmarket last weekend, I saw garlic scapes, which looked similar to the shoots you have pictured above. Do you know if they’re the same thing? — What is sweet wheaten sauce? What does it look like, and how else is it used? I’m glad to hear you can get garlic shoots at your New England coop. Use them in Chinese stir-fries! Garlic scapes are the flower buds of garlic. They are not exactly the same as garlic shoots, which is the very young shoots even before the plant begins to bloom. I have seen garlic scapes in green markets but have never used them. I suspect their taste is similar to the young shoots. It would be interesting to try using them in Chinese cooking. Sweet wheaten sauce is made from wheat flour. The flour is first made into cakes with water plus other seasonings and steamed, then fermented. After fermentation the cakes are mashed into sauce and allowed to age in clay urns. (At least this is the traditional method.) The result is a very fragrant sweet tasting sauce. This sauce is often used as a condiment, especially for accompanying Peking Duck. Hoisin sauce is made from both soy and wheat flour, and has very similar taste. You can use hoisin sauce as a substitute. A friend of mine, Melissa Clark, wrote a great article about garlic in the New York Times today. She talked about green garlic, which is similar to the garlic shoots I discussed here, among different forms of garlic. 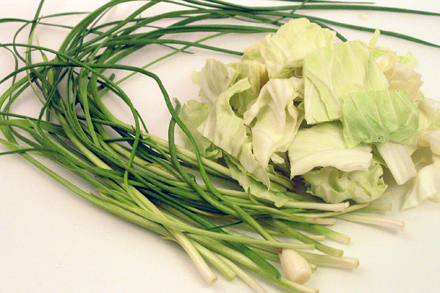 Garlic shoots, however, are much younger and more tender than green garlic. It’s a really fun article, so read it! I love 回锅肉！Thanks for sharing your personal recipe. I had the same question about garlic scapes, i’m glad you clarified it. That dish looks absolutely terrific! btw: have you tried that new chinese restaurant on Mott street? It’s called Amazing 66, not a great name but the food is really amazing. Highly recommended from a gwai lo. hehe. Zen, Yes, I’ve been to Amazing 66. The food is excellent. They really do Cantonese food very well. The steamed pork meatloaf with salted fish is just out of this world! OH this is a lovely dish, now I need to buy some of the ingrediants and have them this come week for dinner! love it! This looks both delicious and wonderfully simple. I’ll be giving it a go! I love suan miao! Always looking for recipes to cook with – i only get to eat it in chao la mian these days – pork belly is another love of mine so thank you for sharing this recipe, we look forward to filling ourselves with it! Can the plum sauce be used with the twice cooked pork recipe? Thank you Avelina for your comment. From what you wrote, I assume you are asking if plum sauce can be used as substitute for the sweet wheaten sauce. If this is the case then I don’t think it is advisable. The sweet wheaten sauce is more like hoisin sauce. It is dark brown and has a sweet soy sauce flavor, but is a paste and not liquid. You can substitute sweet wheaten sauce with hoisin sauce, which is probably easier to find.